October 13, 2015 October 13, 2015 ~ Trevis Dampier Sr.
Chicken and waffles is a craze happening all over the United States right now and especially here in California. When you hear about chicken and waffles out in California; you usually hear about Roscoe’s Chicken and Waffles. That is in Southern California and I plan to stop by there soon so stay tuned for that in the future. 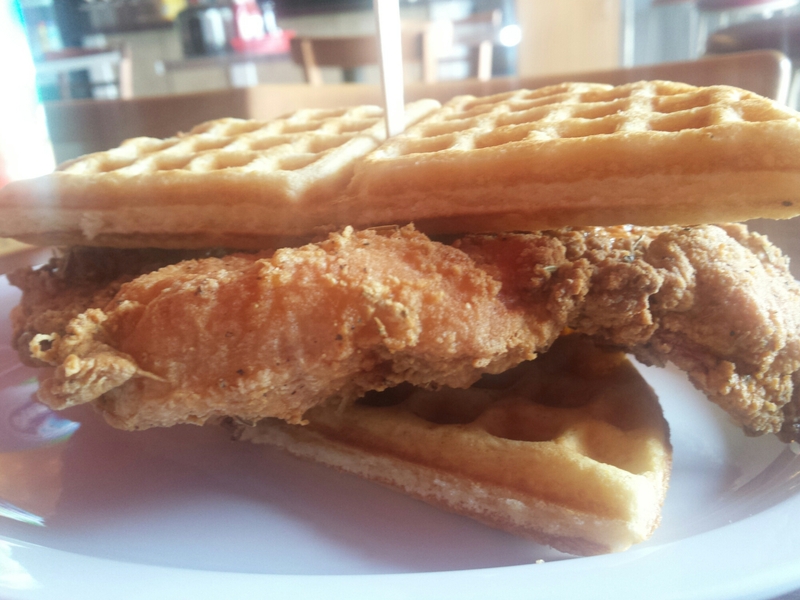 However, today we are talking about Chicken and Waffles in my neck of the woods in the heart of the silicon valley. Let’s talk Butter and Zeus! Like many startups in the Bay Area, Butter and Zeus has a great idea for the new craze of chicken and waffles but they took it a step farther. Not only do they have a chicken and waffle dish on the menu but all kinds of different meat dishes to combine with the waffles. Barbacoa, Pastrami, BLT, Salmon and many more combinations with waffles. Today, I am having a craving for chicken and waffles for lunch so time to dive in.. I arrive and make my order immediately when I walk in the door. They bring me my plate and the chicken is steaming in a sandwich setting lying in front of me. I made sure to add some hot sauce to the chicken and drizzle over the syrup on this sinful looking masterpiece and now time to engulf this thing. I use the fork to slice down this mountain of goodness, with my taste buds continue gushing saliva in my mouth with anticipation of the first bite. The first burst of flavor is from the crunchy voluptuous tender chicken. It has all kinds of flavor coming out of it! It is a buttermilk seasoned boneless, skinless fried chicken breast with honey. The sweetness from the syrup and honey combined with the waffle textures and spiciness from the hot sauce make every bite a heavenly trip of uttermost goodness! True live action eating! Good job Butter and Zeus! If you have never tried Chicken and Waffles I suggest you do fast! I promise you that you will not be disappointed! < Previous I’ll have a Conniption Fit over some Red Lobster Biscuits! Next > Get ready to Crack open your Jaws when dining at Ma’s! !